New Jersey Senate President Steve Sweeney (D-Gloucester) drafted a proposed piece of legislation to lift the cap on aviation fuel taxes paid by airlines serving Newark Liberty Airport (EWR) and divert the additional revenues to fund the PATH rail extension to the airport. The legislation thus eliminates the tax break afforded airlines that limits taxation to only the fuel used for takeoffs and landings. 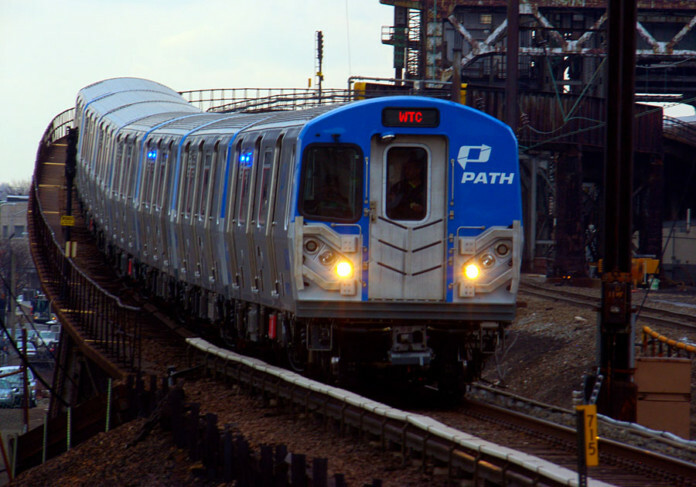 The draft bill, which provides no estimate as to the amount of revenues possible under the new tax scheme, cites a need for at least $700 million in grants and other funding to supplement the $1 billion investment from PANYNJ for the PATH project. Sweeney noted in the bill the project competes with infrastructure spending needs such as the Gateway and Bus Terminal projects, and cited a need for new dedicated funding sources. Federal law does allow for an airport to use airport revenue to pay for an airport’s share of a ground access project if the project qualifies as an integral part of an airport capital project or is owned and operated by the sponsor and is directly and substantially related to the air transport of passengers and property, according to Federal Aviation Administration (FAA) Spokesperson Marcia Adams. Each project, however, is reviewed by the FAA on a case-by-case basis. Senator Sweeney would not answer questions such as whether the tax increase would constitute double dipping since the PATH project already assumes the project would be eligible for $730 million from the Federal Transit Administration. Follow-up questions as to whether the bill would divert all aviation fuel tax collected from airlines serving the airports or just some also went unanswered along with whether or not foreign carriers would be exempt. It seems clear from the language, business and general aviation would be exempt from having their aviation fuel taxes increased. Efforts to clarify whether this is a permanent diversion of aviation fuel taxes paid by airlines also went unanswered. 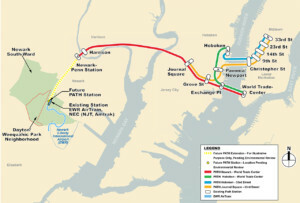 If actually proposed and passed, the diversion would begin on July 1, 2019 and would divert all aviation fuel taxes to the Port Authority of New York and New Jersey for the capital and operating costs of extending the PATH train into Manhattan, according to a draft provided by Sweeney’s office reviewed by Metropolitan Airport News (MAN). The Port Authority said it is not commenting on the proposal nor would United. Map of the proposed PATH extension to Newark Airport. Credit: Port Authority. Once the train project is completed, the bill calls for taxes to be diverted to the state’s Department of Transportation’s Airport Improvement Fund. It would also create a new stop in Newark’s East Ward, a project that has already been rejected by the Port Authority. Contrary to media reports, the bill says nothing about imposing a four-cent per gallon tax on United and its Express partners alone because EWR is a United hub. “As a premiere transportation hub, it is critically important that New Jersey facilitates the flow of people, products and services to its airports,” said Senator Sweeney in justifying the proposal in an email statement. “Newark Airport is the cornerstone of a transportation network that is a key component of the state’s economy, creating jobs and sustaining economic growth. Providing a direct link to lower Manhattan will make Newark Liberty the airport of choice for those doing business in the financial center of the world and it will help ease roadway congestion by creating a direct PATH connection for passengers and airport employees alike. However, many economists disagree travel taxes are effective because they dampen demand. Currently, government-imposed aviation taxes and fees account for about 20% of each ticket. The airline industry points out such taxes are higher than so-called sin taxes on alcohol and tobacco. Airlines for America (A4A), in fact, is lobbying in Washington to reduce such taxes and fend off any increases including the airport proposed increase in the Passenger Facility Charge to cover the rising cost of construction. A previous effort in New Jersey to raise aviation fuel taxes to fund work on the state’s roads and bridges has already been beaten back by the airline industry. Airlines have been very vocal with municipalities that costs to serve an airport matter a great deal, especially when there are alternative destinations or airports that would provide more profits. While that may not apply to Newark, it may be behind the reduction in fees at many airports as airports seek other ways to raise revenues such as hotels. PATH project critics say it would be used by few passengers. 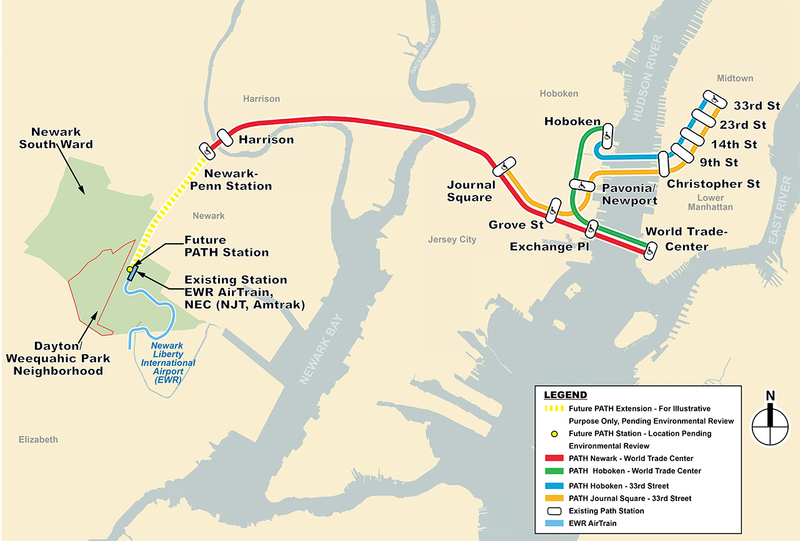 United, however, favors the PATH connection to Manhattan and has actively lobbied the Port Authority of New York and New Jersey (PANYNJ) to fund the project. But, like previous efforts, it is doubtful airlines will sit still for this. For its part, the Federal Aviation Administration encourages intermodal connections at airports for passengers, cargo and economic development. Relationships between United and legislators have a checkered history since the airline was caught up in a bribery scandal that felled Former CEO Jeff Smisek. In the 2011 bribery controversy, former PANYNJ Chair David Samson asked United for a bribe in exchange for support, according to Politico. Samson pled guilty to selling his influence for re-instating an unprofitable flight to his vacation home in the Carolinas. Kathryn B. Creedy is a veteran aviation journalist and author who has covered almost every facet of commercial and business aviation. Her work has included representing Embraer Executive Jets, the Federal Aviation Administration’s aviation regulatory division as well as its communications, satellites and navigation division. She became a spokesperson for ATR, a regional aircraft manufacturer during the 1994 industry safety crisis as a consultant for the public relations firm set up by former White House spokespeople Jody Powell and Sheila Tate. She began her aviation work focusing on regional airlines in the immediate post-deregulation period. She founded a weekly newsletter Commuter/Regional Airline News in 1982 building it to become the bible of the industry. She also co-founded its sister publication, London-based C/R News International in 1987 with Alison Chambers which covered the European market. Kathryn has maintained her interest in the regional airline industry throughout her career. Kathryn has written for Forbes Online and is the author of Time Flies – The History of SkyWest Airlines in which she chronicled the post-deregulation history of the US regional airline industry. It remains the only book to have used an airline as a case study to represent the broader regional airline industry after deregulation.